Yogurt isn’t just for eating as the occasional snack. It’s also an easy way to add a little extra food value to your typical meals. Here, we share five recipes that can easily be made healthier and yummier with a little bit of yogurt. 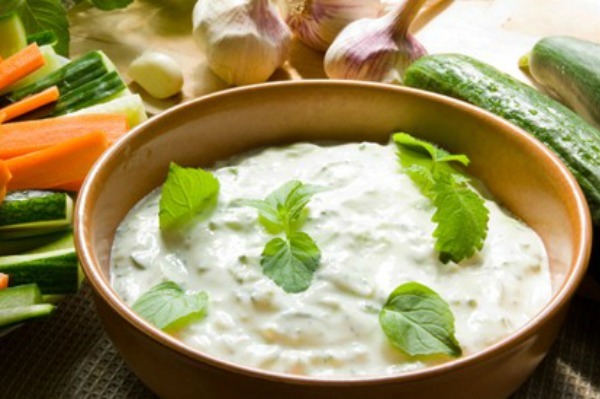 Many dips use sour cream or mayonnaise, which are loaded with fat, to give them their creamy texture. But the Greeks got it right when they created tzatziki. All you need is some plain yogurt, cucumber and a few choice seasonings to create an all-natural, healthy dip. Serve it with veggies, pita or crackers. Or, let it act as a refreshing topping on kebabs or wraps. If you’re holding a party or attending a potluck and you don’t think your friends and family are quite ready for the full-blown healthiness of tzatziki, trick their tastebuds with a 5-layer yogurt dip served with homemade pita chips or whole wheat tortillas. They’ll thank you for creating something so delicious, while you can give yourself a pat on the back for creating a healthy treat for your loved ones. The people of India have used dairy products such as plain yogurt in their cooking for centuries. Many of their traditional dishes use yogurt as a sauce or marinade. Yogurt is particularly great in this capacity, as the acid it contains helps to tenderize meat. For an easy way to get started, try cooking yogurt marinated chicken for dinner. Do you love Caesar salad but hate how guilty you feel after chowing down on a massive bowl, along with pasta and breadsticks? Then yogurt is your answer. Instead of making your Caesar dressing with mayonnaise or heavy cream, use plain yogurt. And for a healthy and delicious alternative to your usual creation, try salmon and caesar salad for dinner next time. Yogurt is great for baking because it adds loads of moisture and its levening properties help dough rise. Cheesecakes, scones, muffins and cakes can all be made extra soft and nutritious with a little bit of yogurt. And choosing to use yogurt doesn’t mean you have to toss all your old family recipes. It can easily be incorporated by using it as a substitute for oil or buttermilk. For a good place to start your experimenting, give Dairy Goodness’ apricot almond mini muffins a whirl. Smoothies are a great way to load your body up with vitamins and minerals. If you prefer your blended beverages to have a smooth, creamy texture, yogurt is the answer. Plus, you can choose a fruity yogurt over plain to add a little bit of extra flavour. There are plenty of smoothie recipes out there that rely on yogurt, so grab yourself a tub and start blending! And don’t forget — when picking out a yogurt, read the ingredients and opt for one with as few ingredients as possible. As a general rule, the fewer additives and preservatives you consume, the better. You should also aim to get a brand that is “0%” as it will have considerably less fat than some of its higher percentaged colleagues. With the right yogurt and the right recipe, your meals can be healthier than you ever thought possible!